President Trump held a rally in West Virginia. The context: The rally comes as Trump's Supreme Court pick Brett Kavanaugh forcefully denied he sexually assaulted Dr. Christine Blasey Ford, who told the Senate Judiciary Committee she was 100% sure he had. That triggered an FBI investigation, delaying the final vote. Our live coverage of President Trump's rally in West Virginia has ended. For more, visit CNN Politics. 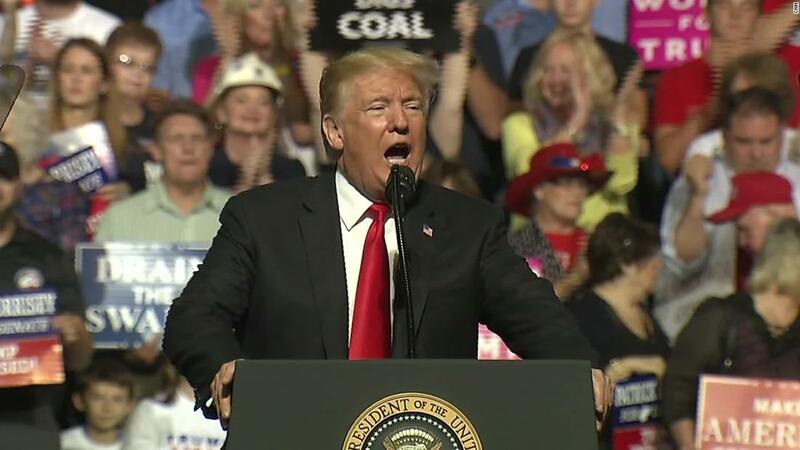 President Donald Trump spent a large portion of his West Virginia rally casting the Republican party as a party of security and prosperity and the Democratic party as a party at odds with law and order. “The Democratic party will stop at nothing to run your lives, run down your values, and ransack our nation’s wealth. They will turn it around, make it bad so fast,” he warned. Trump also said the Democrats want to abolish ICE and support sanctuary cities and open borders. He repeated what he’s said before: He doesn’t want to call it the “Democratic” party anymore. “I hate the way it sounds,” he said, calling it the “Democrat party” for the rest of his remarks. He continued, “If you want to protect American communities, then you need to vote Republican,” naming Senate candidate Patrick Morrissey. “This election is about security and it’s about prosperity,” he said. He was deadpanning presidential behavior in a monotone voice. The President talked about his meeting with Kim Jong Un, saying the US is “doing great with North Korea” and he “fell in love” with the North Korean leader. “Trump said they fell in love, how horrible,” he mocked. He dismissed criticism that he gave anything up to North Korea, touting the return of the remains of “our great heroes” and getting the hostages back. “I didn’t give up anything,” he said. Hours after Democratic Sen. Elizabeth Warren said she was open to exploring a presidential bid, President Donald Trump referenced her at his West Virginia rally, suggesting that Democrats have gone so far left that she is a conservative in comparison. “They’ve gone loco,” he said. West Virginia Senate candidate Patrick Morrisey briefly mentioned Judge Brett Kavanaugh when he spoke from the podium. “Ladies and gentlemen, we must confirm Judge Kavanaugh,” he said. He also hit his opponent Joe Manchin, and sought to tie him to the DC establishment, calling him “Washington liberal Joe Manchin,” noting his vote against tax cuts. West Virginia Senate candidate Patrick Morrisey spoke from the stage, telling attendees to "stand with someone who puts you first, America first and West Virginia first." "Joe's gotta go" Morissey said, referring to his opponent, Democratic Sen. Joe Manchin. The President obliquely referred to the situation surrounding his Supreme Court pick Brett Kavanaugh while talking about the importance of Republican turnout in the midterm elections. “All of what we’ve done is at stake in November. Five weeks away from one of the most important elections in our lifetimes. This is one of the big, big -- I’m not running but I’m really running that’s why I’m all over the place fighting for great candidates,” he said. He referenced Senate Judiciary Committee ranking Democratic Sen. Dianne Feinstein by name, which received loud boos from the audience. President Donald Trump praised his Supreme Court pick, Brett Kavanaugh, tying a vote for the nominee to combatting the Democratic party’s tactics. “On Thursday the American people saw the brilliant and quality and courage of our nominee for the United States Supreme Court Judge Brett Kavanaugh,” he said to applause. “A vote to confirm Judge Kavanaugh is a vote to confirm one of the most accomplished legal minds of our time, a jurist with a sterling record of public service,” he said.